The NFL Players Association had asked all players to observe a two-minute moment of silence before games to honor veterans. Last month, Commissioner Roger Goodell and several owners said that changing the language from "should stand" to "must stand" was not discussed at the league's fall meetings. Other players who have been protesting most of the season stood for the anthem this week, including the Seahawks Michael Bennett, who stood before Thursday night's game. Titans receiver Rishard Matthews walked onto the field holding hands with soldiers and stood with teammates for the anthem for the first time since President Donald Trump criticized players for protesting. Former 49ers quarterback Colin Kaepernick began the protest movement last season. 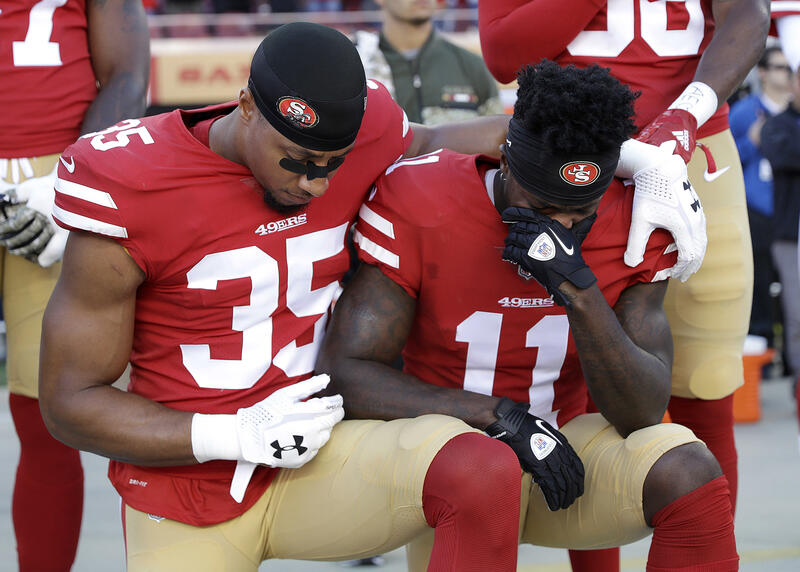 He remains unsigned and has filed a complaint that team owners colluded against him because of the protests - aimed at police brutality against African-Americans and other issues. The California chapter of the NAACP is pushing to get rid of the national anthem, calling the song racist and anti-black. Customers packed a New Jersey bar that decided not to show any NFL games to honor veterans during the Veterans Day weekend and to raise money for a veterans' charity instead.